Schmidt (Jonah Hill) was the kid trying too hard to be cool in high school. He couldn’t embrace his nerdiness. Jenko (Channing Tatum) was the cool kid. But he wasn’t too bright. One thing he did excel at was tormenting Schmidt. After high school, Schmidt and Jenko both ended up joining the police academy. They found the only way to get through was to help each other. Schmidt helped Jenko with the book learning. Jenko helped Schmidt with the physical part. By the time they graduated, they were partners and best friends. 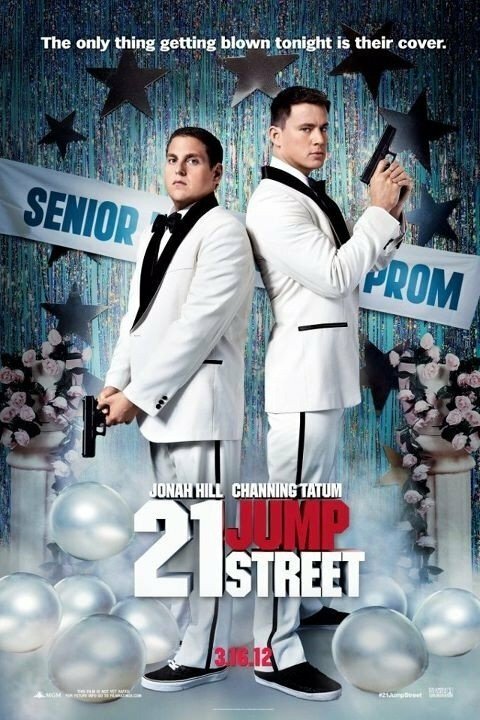 After a botched arrest on a group of pot-smoking bikers, they were sent to work for a special undercover unit, headquartered at 21 Jump Street. The purpose of the Jump Street unit was to solve crimes in high schools in the area. Jenko and Schmidt were trying to find the dealers and supplier of a new drug call H.F.S. before it spread to other high schools and “went viral.” As they head back to high school, after moving in with Schmidt’s parents, Schmidt is worried he and Jenko will fall back into their old roles, and he’ll be left behind. Again. When they get there, they find nothing is anything like they remember. And with that, you’ll have to go see the movie. I don’t want to give anything away. There is so much to experience in this movie. I’m not going to be the one who ruins it for everyone. Just trust me on this one. Honestly, I didn’t have high expectations for this movie. At all. I thought it would be another remake, shredding my memories of a childhood icon to unrecognizable bits. But the movie knows what it is and embraces it. “The guys who were in charge of this, they have no imagination. The take something from the 80s and recycle it.” When you throw in a line like that, you know it’s not going to take itself seriously. Let me just say, my expectations were way off. I can’t remember the last time I laughed this much or this hard at a movie. Literally, tears in my eyes from laughing so much. And it was pretty much nonstop the entire movie. The script is pretty much as close to perfection as you can get. There is enough story to pull you in, and keep you engaged. And so much inappropriate, crass humor, you won’t be able to hold it in. You’ll find yourself thinking, “Are they really going to go there?” Yes. Yes they are. And I love it. They couldn’t have picked a more fitting role for Dave Franco, James’ little brother. (I get the feeling the whole family will forever be typecast in this role.) My only complaint with the acting was Ice Cube. He seemed a little much. Like what I was expecting with a remake. But he’s not in it that much. And with how good the rest of the movie is, I will overlook it. If you can’t tell, I thoroughly enjoyed the movie. We’re talking the first Hangover funny. If they keep the same group on board, and can keep the same quality of work, I will definitely be in line for 21 Jump Street: The College Years.